A floor finish that looks great and stands up to everyday wear and tear is now possible! 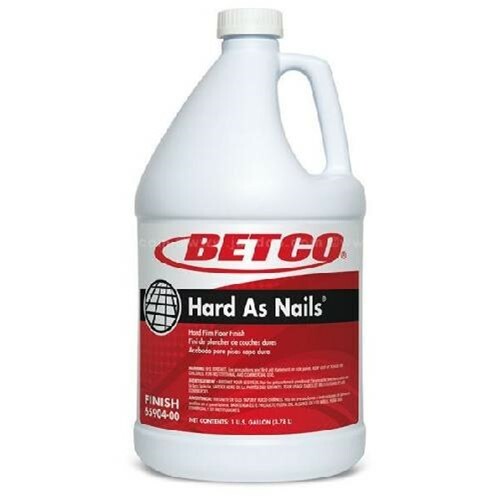 Hard as Nails made by Betco does just that. It utilizes highly durable internally cross-linked polymers blended to achieve a harder floor finish. This unique chemistry results in an high gloss, long wearing finish that cures faster and harder than any other metal-interlock finish. The perfect labor saving advantage for Educational and Retail facilities which have little or no time for floor burnishing. Excellent hardness on any vinyl floor. I used it for several applications on residential use. Two coats gives an unbelievable shine.